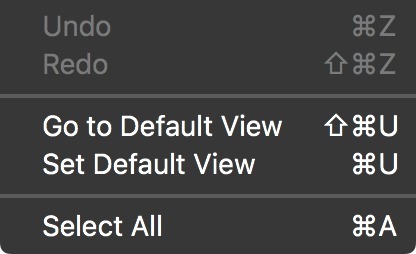 Save as Default – Saves your project preferences as the default. For Pro users, if the project has patches and user data added, then these will also be saved and added to a project with more than one node. 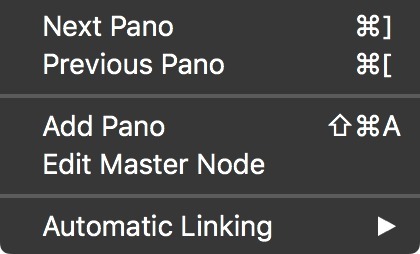 To change the patch and user data, edit the Master Node. Reset Default – Resets the default preferences. Save as Droplet – Save your project and preferences as a droplet onto your desktop for quick image batch converting. Save with Assets – Saves the project and consolidates all associated assets in a new location. You will be asked to save the project. You must save the project to a different folder than the original project. Generate Output – Generate the output without having to open the output panel. Use the keyboard shortcut Ctrl-Alt-G [win] or Opt-Cmd-G [macos]. This will always generate the current output. Play/Pause – Play or Pause the animation. Begin – Go to the beginning of the animation. End – Go to the end of the animation. Current Clip - Only the current clip will be looped. All Clips - All clips will be looped. Off - Turn off looping. Add Track – Adds a new additional track. Remove Track – Removes an additonal track. Mute – Mute sound of video panoramas. Frame Overlays – The Frame Overlays will add an aspect ratio overlay so you can correctly frame the panorama. None - Choose to remove the overlay. ✭ Once you add an output format (HTML5, Animation), you will see the chosen output’s dimensions listed in the Frame Overlays. Overlay Colors – Set the Viewer’s overlay color (viewer borders). Hide/Show Projection Track – Hides or shows the projection track. Hide/Show Additional Tracks – Hides or shows all additional tracks. 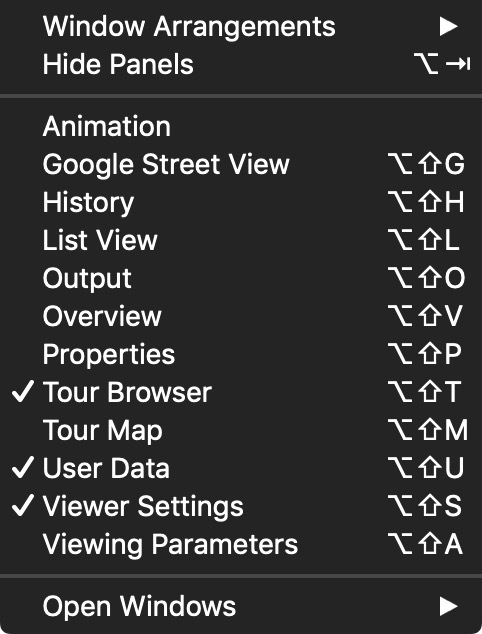 Tour Browser – Opens the Tour Browser. Tour Maps – Opens the Tour Maps panel. Open Windows – Displays a list of all windows currently open. Choose one to bring it forward. 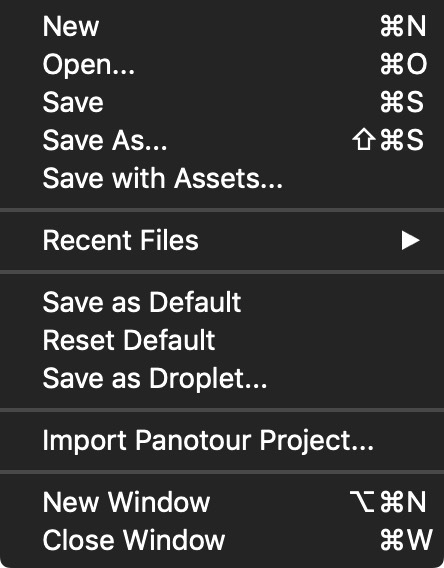 If you’re unsure what files to send, just stick with the default selection (Screenshot, Project file, Skin files, System information, Pano2VR settings).